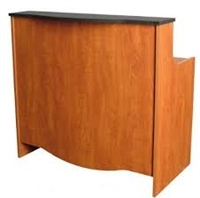 Cameo reception desk with scalloped front, locking drawer, lower computer ledge and wire grommets. Overall 45"W x 25 1/2"D x 42"H. Choice of laminate may be additional charge. Perfect for the Bradford-equipped salon, the Bradford Cigno with Queen Ann legs is an eclectic mix of contemporary lines with traditional styles. Chairs measure 21 1/2" between the arms. 27"W x 25"D x 30 1/2"H. Choice of vinyl may be additional charge. The Cigno reception area chair is fully upholstered, front & back, with tapered cast-aluminum legs. 26"W x 25"D x 30 1/2"H. Choice of vinyl may be additional charge. The perfect chair for the waiting area of the Nouveau salon. Features custom upholstery and steel legs. Choice of vinyl may be additional charge. The Avila II has earned the title of the world's best massage chair.